Arya College of Engg. & IT was established under the aegis of All India Arya Samaj Society of Higher & Technology Education, in the year 2000, by La te Er. T.K. Agarwal Ji, Founder Honorable Chairman. Arya has made a strong stand among the top most private Engineering institutes in the state of Rajasthan. This Group is a blend of innovation, perfection, and creation. The College is spread over a splendid 25 acres of land area, providing a state of the art infrastructure with well equipped labs, modern facilities and finest education standards. The “Arya College Old Campus” for a decade is known to create a benchmark with its specialized excellence, innovative approach, participative culture and academic rigor. 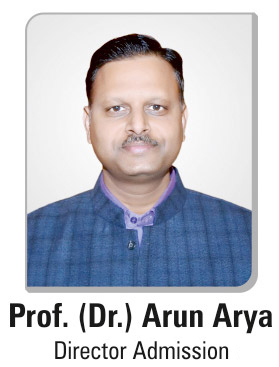 The Management of Arya College is having the right bent of innovation and have the accurate knack to get these innovative ideas of theirs implemented. Globally accredited for its professional emergence towards technical education, Arya College make special efforts to recruit trained faculty and stirring admission procedures to select potential prospects across the country, which are then trained to turn into a pool of skilled intellectual capital for the nation. This helps in a healthy and dynamic exchange which incubates leader in the corporate world. The strong industry linkages ultimately go along the way in providing a holistic approach to research and education. College features a perfect blend of four basic ingredients of contemporary education system viz. Infrastructure, Faculty, Management & Academic. Uncompromising Discipline, Punctuality and Regularity. Innovative Pedagogy that aims at developing drive to Create, Lead and Excel. The Pedagogy is designed to be fully participative. Rigorous Academic curriculum practical orientation constant industry interaction participative seminars & workshops give Arya a pragmatic edge. The teaching learning process is framed in a Global Perspective and is facilitated by the knowledgeable Experienced & highly qualified faculty. Teaching methodology ‘Learning Centre’ and not Teaching Centre. Regular Aptitude Tests, Mock Interviews, Seminars & Workshops etc. Most Dedicated, Qualified and Stable faculty, mainly M.Tech., PhD’s. Fully furnished 7 boys & 5 girls hostels with attach bath.